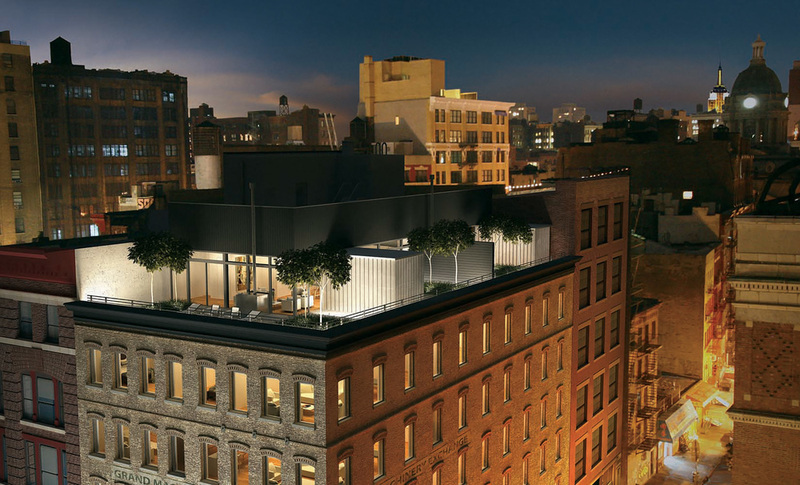 A contemporary interpretation of the classic New York loft building, this 27,000 sf stables and warehouse building was converted into fourteen generous apartments for gallerist Max Protetch. The recurring theme is the thoughtful marriage of new and old - the insertion of elegant, structurally glazed windows into the massive brick façade; the sleek Valcucine kitchens juxtaposed with exposed timber and brick; the glass penthouse floating on top of the solid masonry structure; the use of sustainable materials, products and systems in a recycled structure. Installing a new heavy timber structure inside the original brick shell allowed the beauty of the wood beams to remain exposed – heavy timber is inherently fireproof. This was the first time this traditional construction technique has been used in New York City in fifty years. The renewably harvested timber structure is remarkable for having qualities of new and old at the same time. The addition of a glass rooftop pavilion created two duplex penthouses with expansive terraces and sweeping views of lower Manhattan. All new stairs, elevator, services and infrastructure brought the building into the present and extensive restoration gave fresh life to the classic masonry structure. Designed in collaboration with Rawlings Architects.